Last weekend I visited Bristol, which was the first time in close to four years since I last visited, and just under five years since Bristol stopped being somewhere I lived. I had no specific plan to visit Bristol on what is an approximate 5-year anniversary, but like my last visit events resulted in me making a trip over. This time round I came to Bristol with a life that has progressed independently of the city, and although in hindsight there are signs I left Bristol just before things started to improve, from my perspective they are all too little too late. Earlier in the month marked the day I last worked in the UK, but this was in itself just one of many contemporary milestones in a short period of time, and of these one that was effect rather than cause. Until only recently this job was my longest-lasting employment, which cannot pass without some comment. However I look back at it, my job at the time was sustaining a life situation I knew had to change, and until I left this job nothing was going to improve. To all intents and purposes the job, which I have already written about in depth, was my life. Economic circumstances dictated it be so, but the whole “you have the job” argument about maintaining such as status-quo negates other costs such as mental well-being. The job itself was a strain in many different ways, and in hindsight I was on a road to a breakdown. Leaving the job was an enabling act. It would be a year before my life had comparable stability, and objectively the time in New Zealand before then was pretty much a failure, but it was liberating. It would be three years later — in 2015 — before my professional life would be back on a track I wanted it to be on, and my personal life feels like catch-up. I don't know whether I'll actually own property again anytime soon, though that in itself does not bother me, and renting has the walk-away advantages. My previous visits were likley biased due to the limited areas I visited, and in the case of March 2013 was influenced by a tinge of sour grapes. This latter visit which was part of a visit back from New Zealand, was due to the flat being disposed of, and the date coincided with a farewell party at the student's union building before much of it was to be handed over to university office space. All in a reinforced feeling of many things coming to an end, and at the time I treated it as a final “goodbye”. The February 2014 visit was for a Chinese new-year party I was personally invited to by the organiser, and on this latter visit it seemed Bristol's economy had at least levelled-off, but Bristol city council's somewhat zealous anti-car attitude had finally hit oppressive levels. Both visits made me conclude it was right to leave. A mural of this style with barbed wire on top would not look out of place in Stokes Croft, but this was in Clifton Village — the supposedly posh part of Bristol. 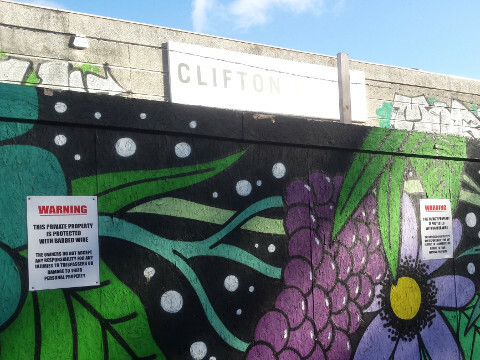 For parts of show-case Clifton to look like a ghetto, I would not hold up much hope for the rest of Bristol being anything like up-and-coming, let alone being the well-off city I once remember it being back in the mid-2000s. This was a shock as I remember friends mentioning that Bristol house prices were shooting up, and later on this view turned out to be a bit pessimistic, but it did show how things would be somewhat mixed. Whiteladies which I visited later had a fair few eateries on it now and they all seemed to be doing well, and the old cinema next to Cowshed is once again an operational cinema. However be.in.Bristol (formerly The Ranch) next to Vittoria seems to have closed down yet again and what was Sasparilla is no longer a tavern, but this area has never really been much of a night-life zone — further up Whiteladies there is no trace of the former Sloanes. Whiteladies between the station and the auction rooms is dominated by kitchen & furniture shops, many occupying at least two retail units in a row, which I remember taking note of previously — it is pretty clear someone behind these companies is driving a hard bargain with a land-lord wanting to avoid high vacancy rates. Having said that the large number of such stores means there is demand for high-value house merchandise, which was not the case back in 2012. I remember the introduction of the Kingsdown RPZ (Residents Parking Zone), which although the consultation was not outright rigged, was in the face of multiple complaints which were not properly addressed. The scheme involved reducing the number of available parking spaces within the area, with the number of spaces expected to be available being far lower than than the number of properties qualifying for permits. Anyway as people like me expected it did end up becoming a money-spinner that was eventually rolled out city-wide as part a nakedly anti-car agenda by a council that when I last looked seemed increasingly communist-leaning. Even though my hotel (I stayed elsewhere the first night) was able to issue me with a temporary permit for the local area, I did not bother as free spaces looked thin on the ground. Parking has always been a problem in Bristol and especially Clifton, but it is not worse than when parking was unrestricted. I suspect this much-expanded controlled parking is partly responsible for killing off shops in the Triangle and Park Street area, as the ones that relocated rather than going bust went to areas such as Cabot Circus that have on-site car parks. Lack of free city centre parking is why I did not bother with any shopping. Shortly before I left Bristol I received notification of traffic flow changes along Whiteladies, and they amounted to loads of extra no-left- and no-right-turn restrictions. They were notionally intended to give buses a clear run, but to me the actual result was to send car traffic around all sorts of crazy diversions on side roads. For instance rather than going west on Tyndalls Park Road and turning left to go south onto Whiteladies road, the idea was to take the further-south University Road (a turn hard to get out of), or go straight ahead and swing around St. Pauls Road & Queens Road (bit of a detour). To me it was clearly intended to screw motorists over as a primary objective, and since I was without a sat-nav device I decided against trying to drive around the area based on memory. Bristol has always had a fair amount of CCTV in the city centre, but it now seems to have put in a lot of car lane cameras rememiscent of the London congestion charge zone, but since Bristol does not have such a zone I am left wondering why Bristol needs what I assume are ANPR cameras. The University of Bristol has always been a major presence in the city, but its presence seemed significantly more overt than it used to be, and I get the definite impression that the city centre as a whole is more student dominated than it was five or so years ago, which is quite a thing given that the number of students actually going out is well down. Even in the student-dominated 1990s and early 2000s, Saturday nights were normally when locals went out, but this particular Saturday night seemed to basically be all students. I went to Antix purely because I wanted to go somewhere students would avoid, and it was pretty empty (at least from where I was sitting) the whole time I was there, and those who did come in looked pretty young to me. One of the reasons I left Bristol is because being a non-student in a student-dominated area is not much fun, so this was a big red flag to me. While passing an accommodation shop I had a quick look at property rental prices, and for the Whiteladies Road area it was around the £420-460 per-person per-month mark for flats, and there was one flat (forgot whether it was also Whiteladies) which was around £680 all-inclusive. I remember £400/month being a common price back in 2006, so £450 in 2017 for a city centre place to me actually looked cheap. I don't know if these prices are representative of the city as a whole, but they are certainly at odds with Bristol's supposedly rising house prices. The idea of leaving Bristol & the UK was something that even at the time I regarded as trading in a lot for a spin of the roulette wheel, and although it did not pan out as I intended, I do not regret leaving. There is very little of 2007-2012 I looks back to with any real fondness, especially when compared to 2012-2017 which ushered in the changes I desired, and even then many of the highlights from the former were not even within the UK. Pre-2012 was a different life, and while Bristol has nice things about it so do other cities, and it was elsewhere things started to happen. Even as a student I spent significant amounts of time away from Bristol, but even the odd few months away is nothing compared to the almost four years since my last visit, and a lot of things are not as I remember. Some of the places I dropped by actually felt a bit of a choir to visit rather than sentimental, so it is clear that Bristol is no longer anywhere special for me. There were one or two places I was still recognised from years past, but other places it felt like I had never been previously, and I suspect very few of the university staff or security would still remember me. There is clearly more money in Bristol compared to what I remember, but it is not in the areas I would expect it to be. One point that has to be addressed is thoughts about what may have happened had I simply stayed put in Bristol. Looking back five years I needed a physical and emotional clear-out, but doing it without the drive to prepare myself for emigration would have been punching holes in the old and leaving them unfilled, rather than an “out with the old & in with the new”. The shredding & burning of (almost) all papers was probably was a bit ritualistic, but a major point of the process was taking a final look at everything. Had I stayed put in Bristol there are some ways I would have been better off, but there is simply no guarantee that I would have obtained the experience or the mentality I now have. Back then I had already let year after year fly by and the overall feeling was of old disappearing bit-by-bit with no new in sight — waiting indefinately with nowt on the horizon was not an option, and in hindsight I had reached a now-or-never point. Following on from above is whether I would consider moving back to Bristol, assuming I returned to the UK, which in itself is now a steep prediate. If I still had my Bristol flat then I might consider a return to the city, but without it any return will be circumstances inferior to what I had before I left, which I had long classified as an admission of defeat I would not accept. Bristol has nice things about it, but they are no more sentimental than things in various other cities I have now spent time in, and I feel it would be better to put memories to rest and seek a clean-slate fresh-start rather than trying to deal with any regrets in the mix. The city centre seems to be more in the shadow of the university than a few years ago, which to me is a major negative point.